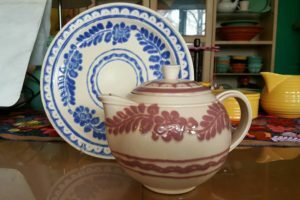 The artist and potter William “Harry” Bird designed several bespoke patterns for Vernon Kilns in the mid- to late-1930s. Little is known about Bird – there are rumors that he rented space in Vernon’s plant; there is no indication that he was an employee of the company and may have produced his work under contract or self-distributed. 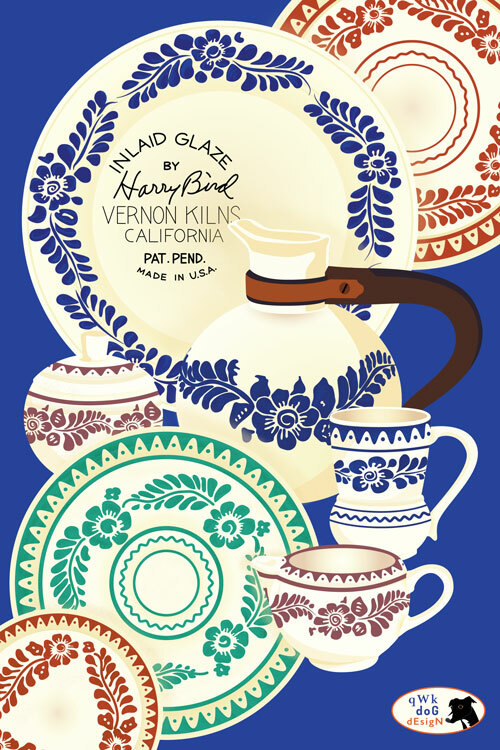 All of Harry Bird’s designs were produced on Vernon’s “Montecito” shape (Early California and others). 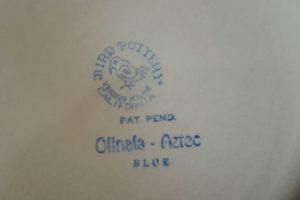 Bird may have been the first to leverage the in-glazing technique of decorating, also used by Pacific Pottery on their decorated ware starting around 1935. According to this advertising piece, the actress Dolores Del Rio commissioned a set of dinnerware from Harry Bird and Vernon Kilns based on traditional Mexican pottery designs. 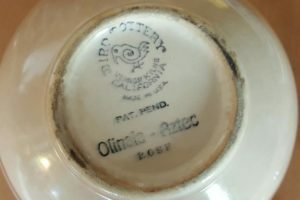 Vernon Kilns offered it to the public as Olinala-Aztec (with rings) and Montezuma-Aztec (no rings). The pottery was available in four colors: blue, green, yellow (orange), and rose on a light beige background. As with most of Harry Bird’s designs, these patterns are hard to come by.